Fit for Fashion, a first-of-its-kind reality TV show which will be hitting Asian TV screens in October, has unveiled its celebrity line-up ahead of the show’s official launch later this month. The unique show will be hosted by lifestyle, fashion expert and host Louise Roe – the well-known presenter of Plain Jane on MTV International. Louise previously hosted NBC’s hit competition show, Fashion Star, and co-hosted Style network’s first ever LIVE show, Style Pop. With a background in journalism, she began her career at Vogue.com in the UK and has since contributed to numerous publications around the world. She is also a host on the popular US entertainment show, Access Hollywood. In addition to Louise, the show will also be graced by the presence of expert trainers Christine Bullock and Mitch Chilson – who will be putting the ‘fit’ into ‘Fit for Fashion’. Over the course of the show’s run 12 ordinary women and men will be transformed with Christine and Mitch’s expert guidance and the help of Fitness First’s proven training methodologies. Christine has been teaching fitness from Pittsburgh to Los Angeles for over a decade, although she has been in the fitness world for her entire life. Christine’s knowledge as a wellness expert has resulted in appearances on E!, America’s Next Top Model, VH-1, California Life and PopSugar. She is also a contributor to a variety of publications including Oxygen Magazine, In Touch Magazine, Life & Style, FabFitFun, SheKnows, Examiner, Inside Weddings, Simply Stylist, Lucky.com, HauteLook and many more. Christine believes that embracing better eating habits and incorporating a personal exercise routine into one’s daily routine is vital to having a balanced life and this is something that she will be conveying to the contestants during the course of the show. Christine’s fellow trainer, Mitch Chilson is also no stranger to being on TV; Mitch has hosted numerous television shows, including SuperModelMe and Mega Kids. Mitch’s perfect form has also been featured as a model across the Asian region. Mitch believes in a holistic approach to fitness and this led him to become the programme director for some of the largest training facilities in Asia, which included a wide range of specialisations from fitness and nutrition, to martial arts and kids. He has also been a professional athlete in his own right, and is a two time ESPN Martial Combat MMA Champion. Additionally, he also has a solid base in Brazilian Jiu-Jitsu and is 1 of only 7 Muay Thai instructors outside of Thailand certified by the Grandmaster of Muay Thai Kru Yodtong Senanan. Mitch’s holistic approach to fitness, physical health and his experience in mentoring and professional competition, make him the perfect all round co-trainer to make the contestants ‘Fit for Fashion’. In addition to Louise, Christine and Mitch, the show will also feature the renowned fashion photographer Todd Anthony Tyler who will be dispensing fashion and styling advice and taking stunning photos. Todd will also serve as one of the show’s four judges. Todd is hugely experienced and widely recognised both in Asia and globally. He broke into the fashion industry as a model, and then began to pursue his lifelong love affair with photography, this time from a different angle. With 20+ years of combined experience on both sides of the camera, the Canadian-born photographer uses the lens to push the boundaries of style and creative exploration. For over a decade, Todd has operated a successful studio in Shanghai, China, becoming the photographer and art director of choice for his knack to transform models into icons. His unique point of view on producing artistic imagery is expressed candidly each month in a column he writes for Asian Photography, India and Asia’s premier professional photography magazine. With Todd’s fashion expertise, Christine and Mitch’s fitness knowledge and the experienced advice of celebrity host Louise Roe, the contestants of Fit for Fashion will be in good hands while undergoing their transformations. 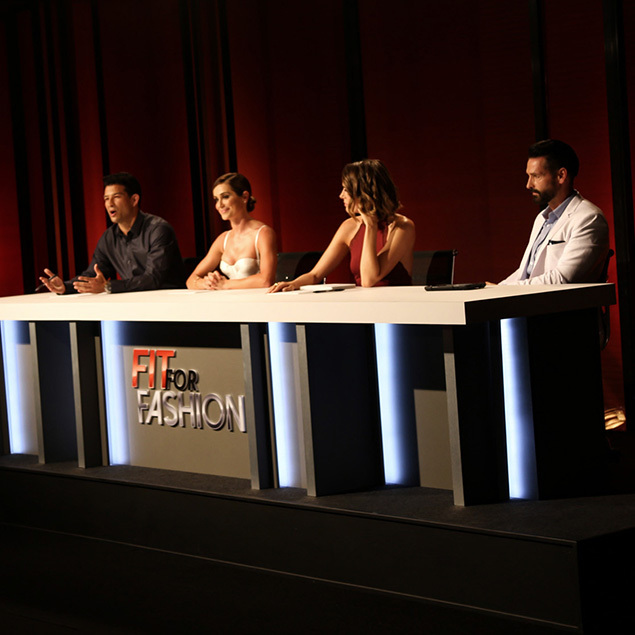 Fit for Fashion is a partnership between Fitness First and Imagine Group, who have produced other hit shows including The Contender Asia, The Biggest Loser Asia, The Challenger and The Apartment. In collaboration with FOX International Channels, Fit for Fashion brings fresh and inspiring content to a diverse audience through StarWorld, Asia’s leading female entertainment channel. The channel, part of FOX International Channels network, is available in nearly 9 million homes, reaching 17 countries and territories across Asia and the Middle East.